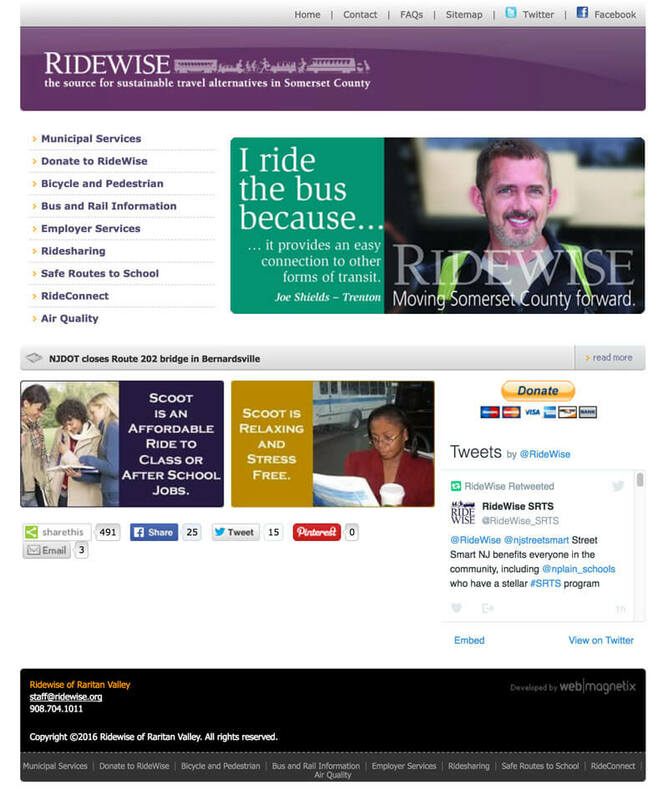 Ridewise was a winner of our Fall 2016 "best friends" web grant. We selected them because their website was very dated and had no clear focus or messaging. We believed in what they were doing and were confident a new website would help them raise more awareness and create a movement of people wanting to utilize the various methods of sustainable travel in NJ. The website was developed on Wordpress and focuses on content first. Allowing users to easily find information, carpool opportunities and local mass transit information was at the forefront of the redesign process. The old website was a custom solution that was outdated and lacked in focus, clear navigation and gave the organization a very dated look.There is an image below that shows how the website looked before our redesign. With a busy home page it was not clear what the organization wanted the user to do or how the user can find the content they needed. The site was not able to be easily updated by the Ridewise staff and the developer of the original website was no longer maintaining it so the organization had their hands tied in making edits or updates. 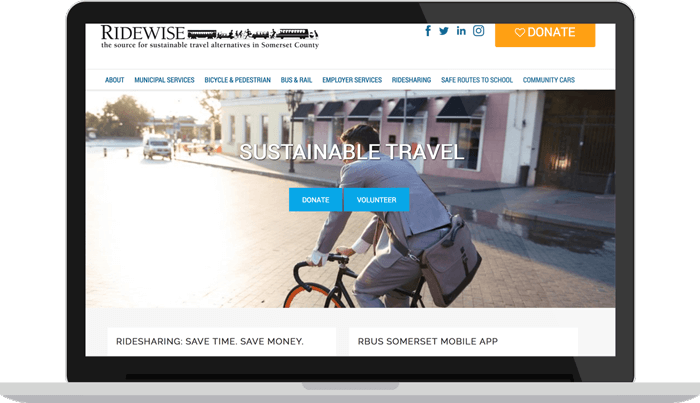 We provided Ridewise a large portion of our bi-annual grant to help them develop a new Wordpress website for their nonprofit organization. They can now easily make updates with our custom administrative area and can easily update and change their navigation and content as needed to keep their readers updated on relevant news and services. The website features toggles for displaying important resources and information in a clean manner, a prominent donate button and call to actions on the home page give users direction and of course our special nonprofit admin area for easy updating! Driveless is a program that Ridewise promotes every June that is a competition to see what person or employer can save the most cubic feet of CO2 by utilizing alternate forms of transportation. 2 Dogs Media was hired for this portion of the website to create an app that works within Wordpress to track user data. Users log into their account to track their miles saved by walked, telecommuting, ridesharing, bicycling or taking mass transportation as opposed to doing their normal daily commute. These miles are then calculated as a total miles saved and also from this value we can determine the amount of CO2 saved by taking these methods of transportation over driving. Employers can also take part and users can add an employer to their profile to be able to have the employer eligible to win. Each week a solo winner and employer are chosen as winners and then final winners are selected at the end of the program.